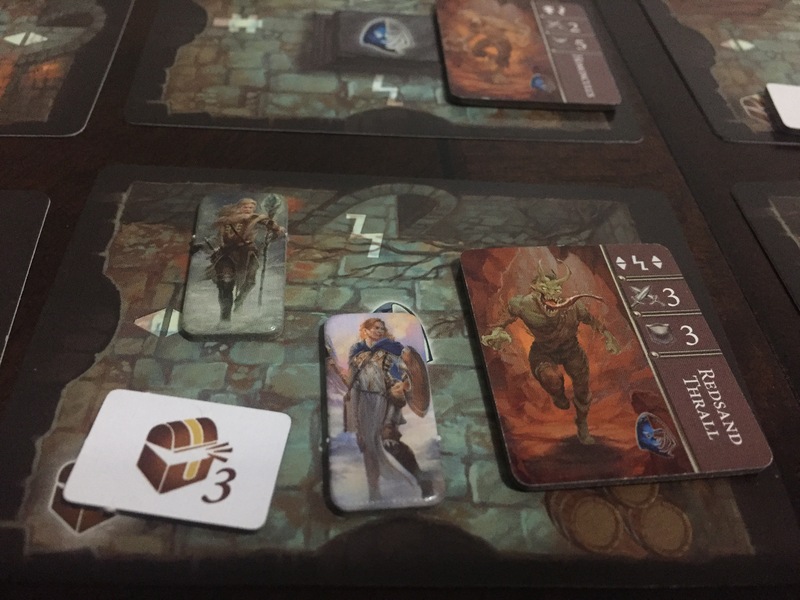 Shadowscape is a card-based, small box, dungeon crawling adventure game for 1-4 players that can be played competitively or cooperatively. It was designed by Blazej Kubacki and published by NSKN Games. 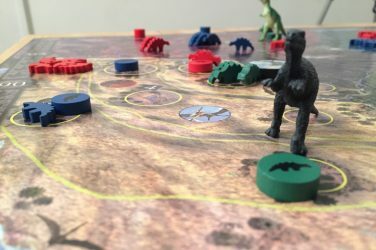 I love a good adventure board game. 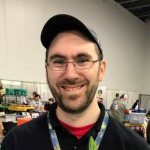 I grew up on D&D, but I’ve also come to love games like Descent/ Imperial Assault, Gloomhaven, Mistfall, and lots more. However, I have a hard time getting them to the table as often as I want because of their size. Between setup/ teardown, reading scenario rules, and actually playing the thing, I could probably have used that time on 2-3 other excellent board games during a game night. At least, that’s what my game store group would prefer (sad face). That’s why I get excited when a designer tackles the project of a true adventure game in a small box. 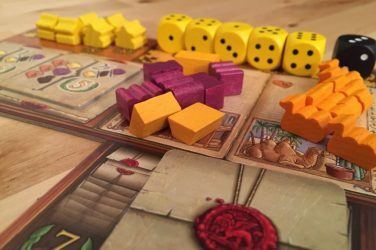 We’re not just talking the approximation of an adventure, like Elder Sign, One Deck Dungeon, or Tiny Epic Quest. 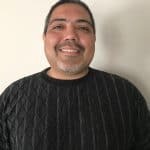 I’m talking about a true adventure with rich mechanisms that allow me kill enemies, gear up with some treasure, and take down a big bad boss at the end. Enter Shadowscape, a game in the Mistfall universe. 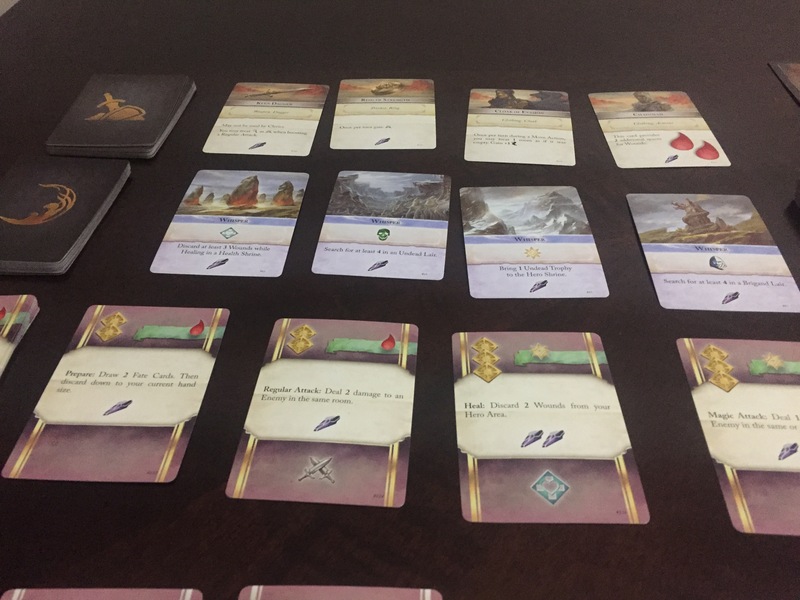 Shadowscape promises to take all of the gameplay contained in tiles, miniatures, and big scenario books and deliver it in the form of cards. Lots and lots of cards. Holy, moly, there’s a lot of cards in this little box! Does Shadowscape fulfill its promise and truly deliver a epic adventure? Your dungeon consists of 25 cards, laid out randomly in a 5×5 grid. Each card represents a room with a specific function. Most of the rooms spawn monsters – ether undead, bandits, or beasts. The other rooms represent shrines to different feats of heroism. You will often travel to these other rooms with your loot in order to complete quests. 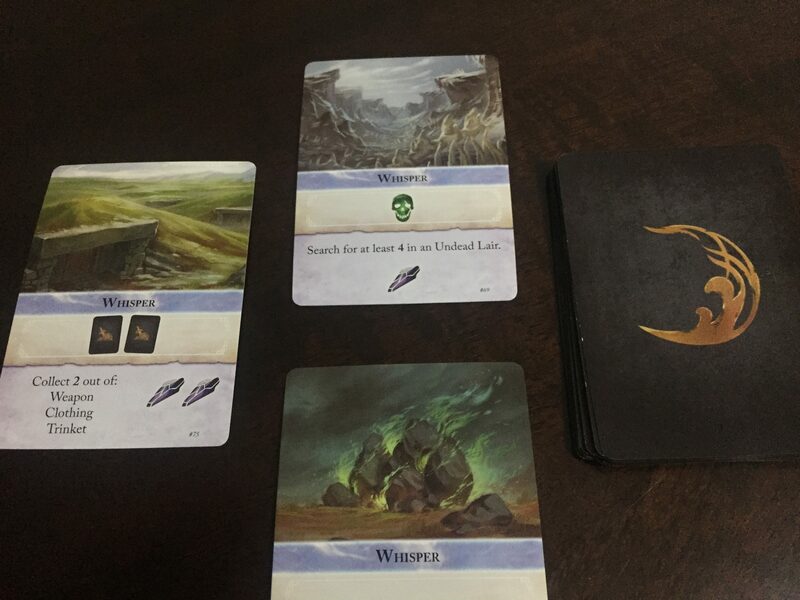 At the start of the game, you will receive your hero card, a set of double-sided action cards, some Fate cards that represent one time use powers, and a small token to represent your hero on the map (or a real mini, if you buy the Heroes of Mistfall Miniatures pack). The hero selection is standard fare – variations on rogue, wizard, cleric, fighter. 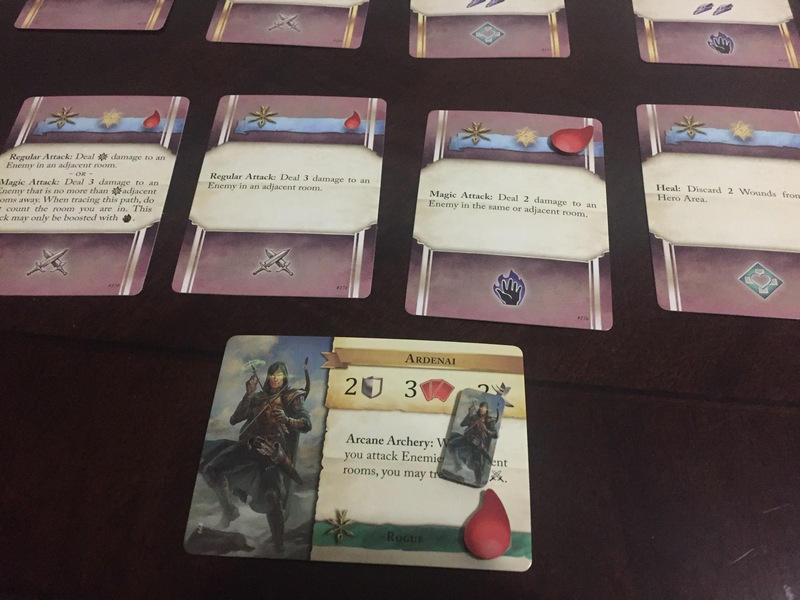 Victory in Shadowscape consists primarily of understanding the double-sided action cards and using them well. You get two actions per turn, which you use your cards to activate. You can use any card to move, but you can also use them to launch attacks, search rooms for treasure, heal yourself, or draw power cards for your hand. After you perform your action, you flip the action card to the other side. That other side usually shows either a different action or a different way to perform the same action (like a melee attack/ ranged attack). Therefore, you can’t spam the same turn over and over again. Aside from regular attacks, each hero has a special attack that keys off of the yellow stars on the top of some of the action cards. Setting up your big attacks creates a ton of the turn-by-turn decision making in Shadowscape. Do I use my resources to search this room for treasure? Or do I keep my action cards lined up and bide my time for a big attack on that pesky Bone Drake? As mentioned above, you also get a hand of cards called Fate Cards. You can either use them for their one time use effects, or you can use the symbols on top of them to boost your basic actions. Many of your attacks, for example, won’t do enough damage on their own to kill enemies; you have to boost them with Fate Cards in order to have any chance at success. At the end of your turn, the enemies automatically move and possibly attack. Symbols on the enemy tokens determine enemy movement. As a player, that makes running the enemy turns very easy. In terms of your character, they can see where enemies might likely go and adjust accordingly. As you adventure through the dungeon, you will earn trophies from the enemies you kill as well as treasure tokens from successful searches. You use these to complete quests from a Whisper Deck that move the progress of the game along. In addition, you can also cash them in to buff your character, either with more action cards or with treasure. None of these power-ups really allow you to do anything differently; they mostly improve things that you can already do. 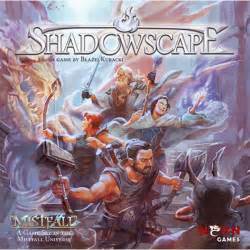 As mentioned previously, you can play Shadowscape competitively or cooperatively. In competitive mode, you aim to gain the most victory points, represented by the purple shards on many of the cards. Although you cannot attack one another directly, you can use your Fate cards to manipulate the enemies into attacking your opponents, or even change the layout of the dungeon itself. As a cooperative game, you work together to complete the game’s many quests. No matter how you play, eventually you will summon the main boss of the dungeon. It usually has a nasty power and a very high armor rating, so you need to bring your best in order to defeat it. In competitive mode, whoever has the most purple shards on their cards after beating the monster wins the game. In cooperative mode, you have beat the big boss collectively before the Fate Deck runs out. Use those Fate Cards wisely! You may have noticed that the two different loss conditions do not include dying. Actually, you don’t die in Shadowscape. You take wounds (the little tear shaped red tokens) and put them on your action cards, which locks you out of those powers. If you get locked out of everything you can do, you simply use your heal action (which can never be locked) and keep going! Card games have the advantage of allowing for a ton of diversity and, therefore, replayability; Shadowscape takes full advantage here. 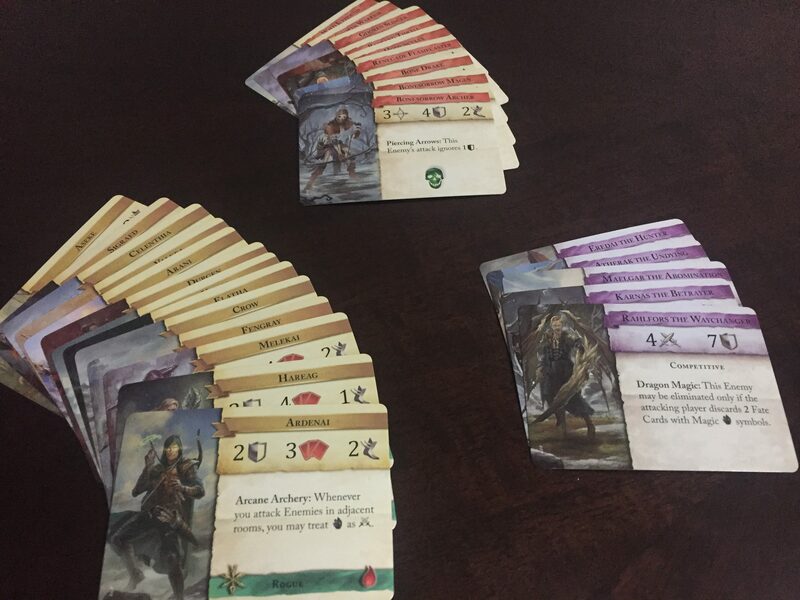 The base game comes with 13 heroes, five enemies, and some alternate monster cards for greater challenge. 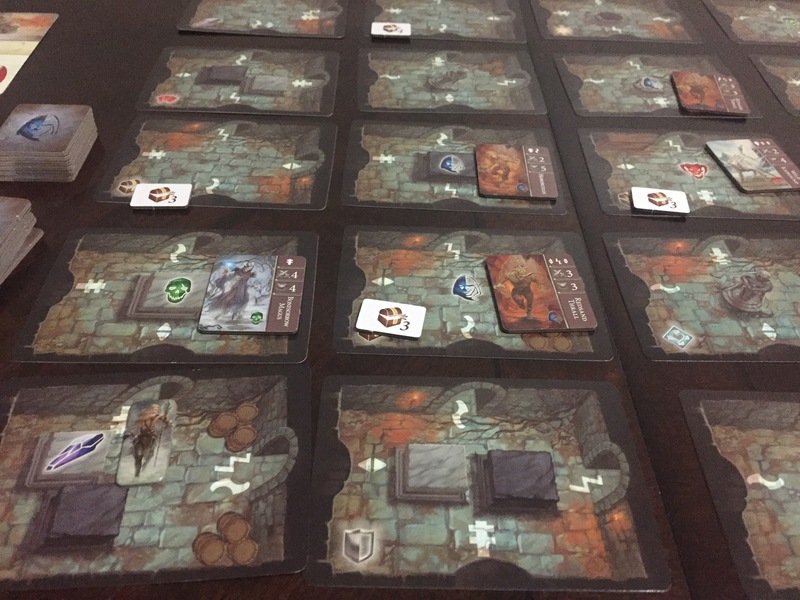 An expansion, Deeper Dungeon, was available via the game’s Kickstarter and will hopefully be sold in retail at some point. In addition, you can find official PDFs of solo and cooperative scenarios that change up gameplay. All of that, in addition to the randomized dungeon setup, creates space for very different play experiences with each game. 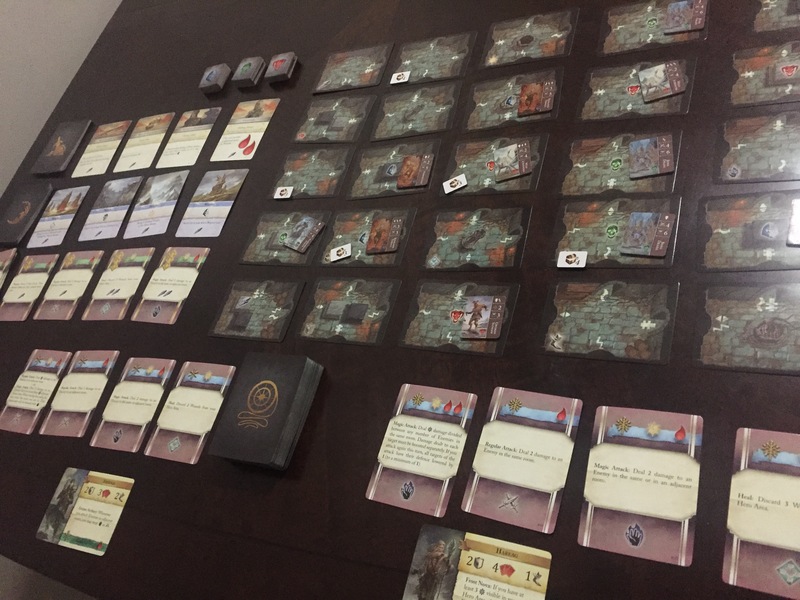 From the perspective of mechanisms, I thought the double-sided actions cards worked very well. I liked that they forced me to change up my actions from turn to turn. Also, they challenged me to think carefully about my actions, or I would lock myself out of key actions that I might need to win. 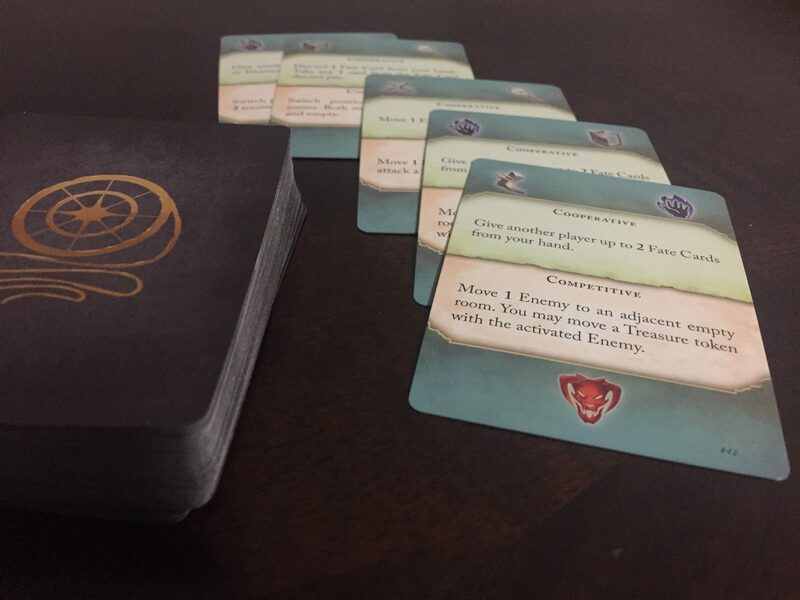 Both the competitive and cooperative games care races to complete quests fast; either you race your opponents, or the Fate Deck. Therefore, you have to be super efficient and make sure you can, for example, complete a search quest or snipe an enemy trophy without wasting a lot of time on moving. I also thought the designer did a good job differentiating the characters without making them TOO different. No matter the class, most character action cards were about 60-75% the same – basic attacks, heals, searches, etc. However, some characters had more frequent and/ or better search capabilities, or could draw from the Fate deck more or less often. Each character’s special attack was also very distinct. That made it easy to play many games with a bunch of different characters and not have to totally reset my brain every time. Finally, I really liked that it delivered a decently big adventure feel in under an hour (for the most part). A four-player game might take a long time, especially with newer players. I don’t recommend the game at four players, especially as a competitive game. However, at lower player counts and as the game becomes more familiar, you can set it up and bang out a game or two fairly quickly. Not bad for a somewhat thinky game that emulates a whole dungeon adventure. 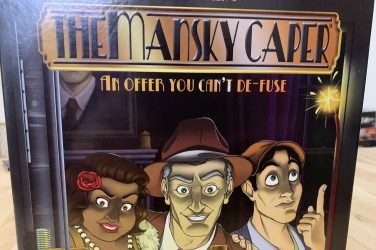 Although I generally like Shadowscape and will keep it in my collection, I did find flaws in both my competitive as well as my cooperative experiences. With regard to cooperative mode, I noticed that many reviewers have already mentioned that Fate Deck timer frustrated them. Personally, I found that the Fate Deck timer turned Shadowscape into a Euro-style efficiency game, rather than a purely fun dungeoneering experience. For example, in co-op mode, you have the complete almost the entire quest deck before summoning the main boss. Once you get to know the quests, you can easily set yourself up ahead of time and respond to cards that will likely come out. That dulled any adventurous, “come-what-may” spirit I usually associate with these types of games. I also found that enemies were very, very easily manipulated. You start with four of each type on the board. They don’t spawn again until you’ve killed them all. So, I could easily kill three in a way that allowed me to get some upgrades and satisfy quests, while keeping one running around (or running into a wall, if it was a zombie) while I did my thing. The best adventure games find a way to deliver both the “puzzle” and “adventure” experiences. I found the cooperative mode of Shadowscape swung heavily towards the former side of that pendulum. If you’ve played Legends of Andor (which I do not like precisely because it’s such a tight, unforgiving puzzle), Shadowscape tickled that same part of my brain. If you liked LoA, though, this might be the game for you. 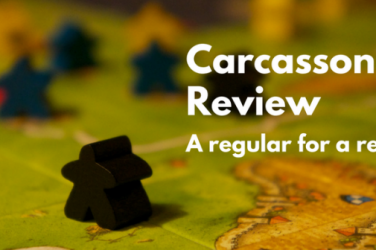 If you aren’t bothered by the theme disconnect, then the competitive mode might feel like a slightly less mean version of Cutthroat Caverns, but with Euro-style mechanisms. You could really screw up someone’s turn by sending an enemy at them and filling their power cards with wounds, or by swapping their position right as they were going for a big quest. That didn’t appeal to me at all. However, that’s probably subjective to my tastes as a gamer. If that kind of thing sounds appealing to you, then have at it! Final Verdict/ Who is Shadowscape game for? Ultimately, Shadowscape might lack too much of an adventuring “spirit” to truly appeal to dungeon crawl fans. 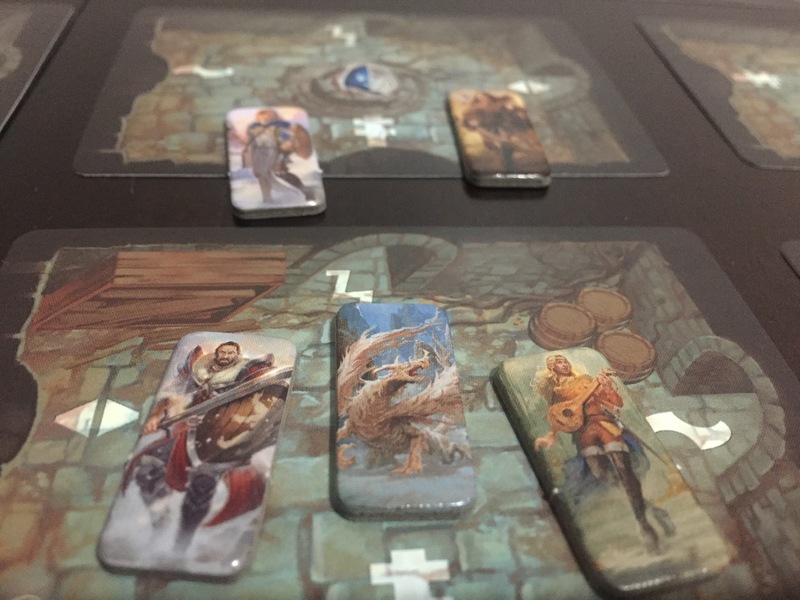 Successful play involves learning the game’s meta in order to solve the puzzle it presents, perhaps a bit more than actually feeling like you are questing in a dungeon. At the end of the day, though, I feel the double-sided action card mechanism really gives Shadowscape some mechanical weight and interest and makes up for some theme disconnection. You must approach the game strategically, planning two or three (or more) moves ahead of time in order to do well. The payoffs for good, strategic play are very satisfying. As I said above, despite my issues, I plan on keeping it in my collection and pulling it out in situations where I don’t have time for a bigger adventure game. 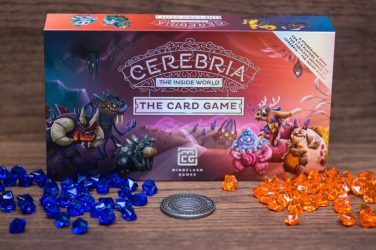 A card-based, small box dungeon adventure game that will tickle the puzzly part of your gaming brain.